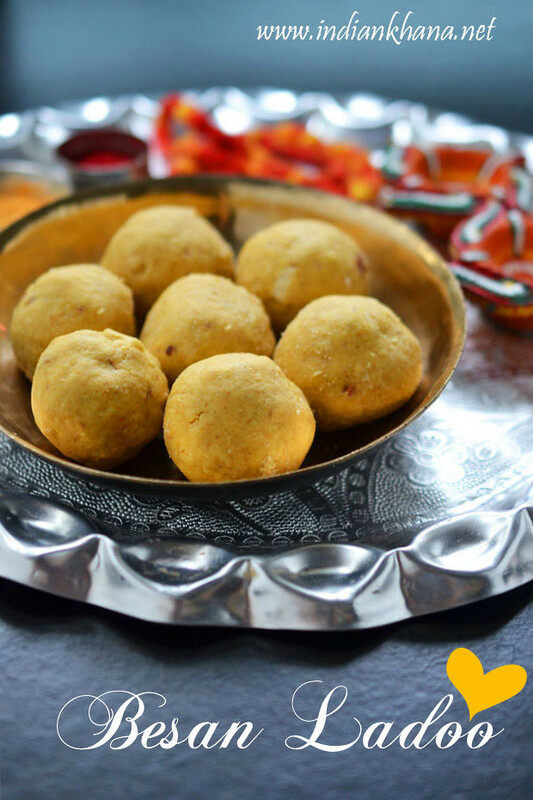 Besan Ladoo , Besan Ke Laddu is easy, healthy laddu made with minimal ingredients and taste delicious. Popular during Ganesh Chaturthi, Diwali but besan ladoo has to be the most popular ladoo for any occasion, celebration. Made with bengal gram flour or besan as it's known, sugar and ghee melt-in mouth laddos are delicious, we just need to make sure we roast the besan well to get delicious laddoo. 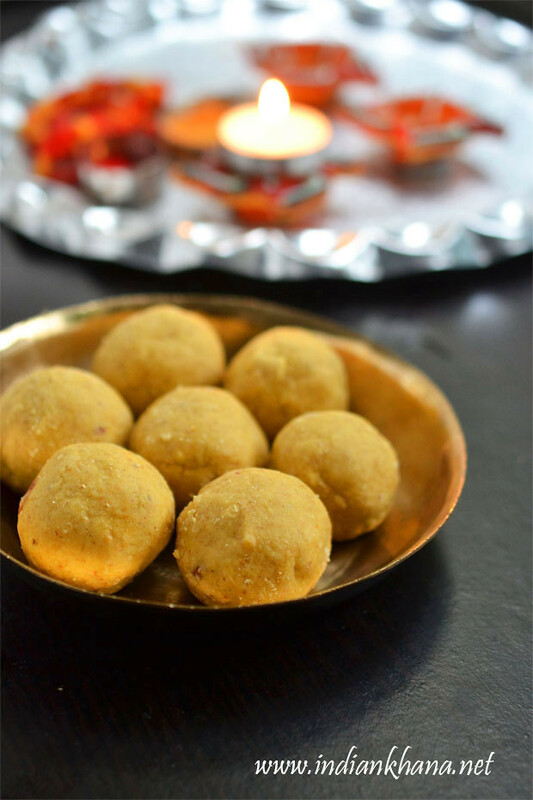 If you look for some easy yet yummy sweet for Diwali celebration then try this ladoo, besan ladoo made in few ways one that is shinny and very soft due to extra ghee added and some ladoo will be one drier side. But this recipe is just perfect balance between the shinny and dry version of besan ladoo. Even DH whom doesn't like ghee at all ate this ladoo with joy and didn't crib about ghee at all so go ahead try it. The two ladoo that I make the most are Sooji (Rava) Ladoo and Besan Ladoo, it's my duty every time to make ladoo whether I am in parents place or in-law's place and I make besan ladoo every year so many times but was never able to post it as these ladoo disappears in no time at all. 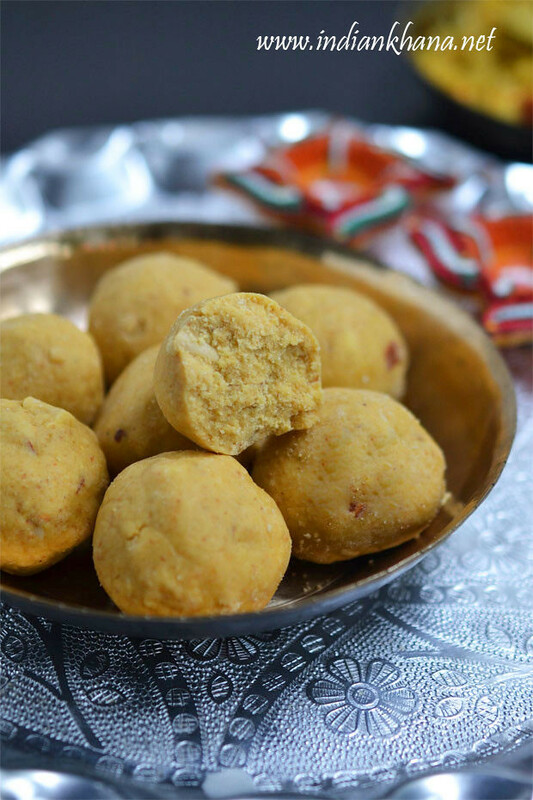 These ladoo is good for kids and adults so go ahead and make some. Once very funny thing happened, just before Diwali my friend asked to help her making some sweet and I made besan ladoo with her and chatting with her I added extra ghee, after the some time the laddo were just becoming halwa and couldn't hold the shape at all :) So make sure you measure ghee and add in small quantity first if not measuring. 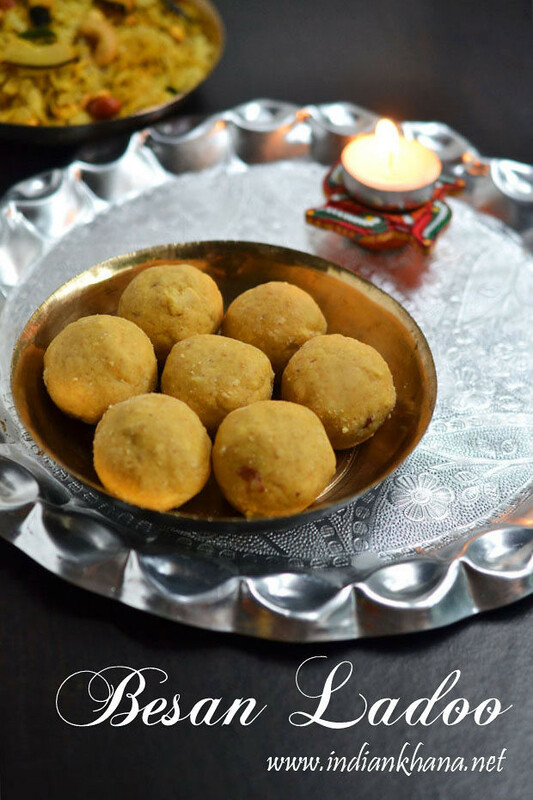 This diwali enjoy these yummy cute besan ladoo. 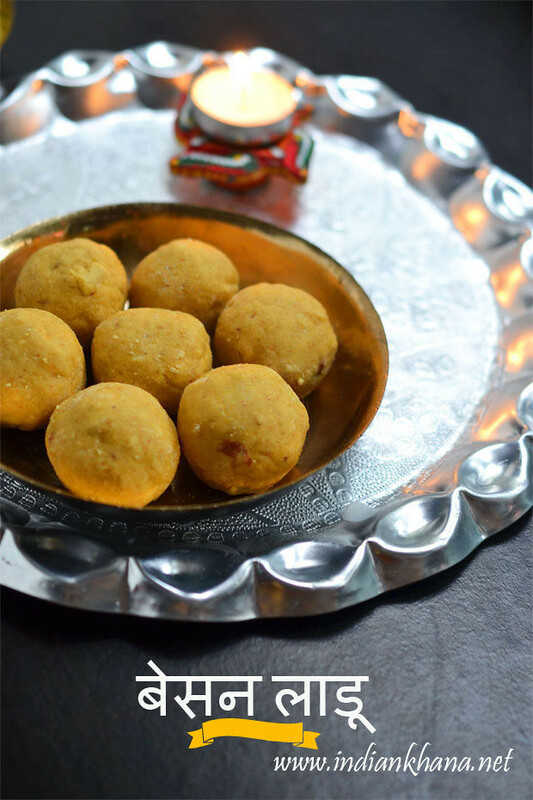 Rich, delicious & popular ladoo with gram flour (besan),sugar, ghee and nuts. Grind sugar with cardamom seeds into powder. Chop almonds and cashew nuts in to small pieces, keep aside..
Heat ghee in heavy bottom kadai/pan, add sieved besan/gram flour or kadalai maavu. Roast besan in low flame until aromatic and light brown with non-stop stirring. Add sooji or rava (fine rava) and roast for 2-3 mins, add chopped nuts and mix everthing well, roast for 1-2 mins. Add powdered sugar and mix well to combine everything, off flame. Allow besan mixture to cool down for 5 mins and then add sugar powder mix well until sugar combines. Allow mixture to cool for 10 mins and then take small portion of mixture, press into ball/ladoo shape. The mixture will be still warm so be careful. If you are not able to bind the ladoo and it's breaking then add 1 tbsp of melted ghee at a time and try again. Lay ladoo in a box or plate and let them dry, if you feel ladoo looking soft, after they gets dried for some time it will be fine. If you are using ladoo besan which is lightly coarse then normal besan then skip sooji/semolina. Cardamom powder adds good flavor to the ladoos so don't skip it. Sieve besan before roasting to avoid any lumps. Roast besan only in low flame and stir non-stop to avoid flour from getting burnt. 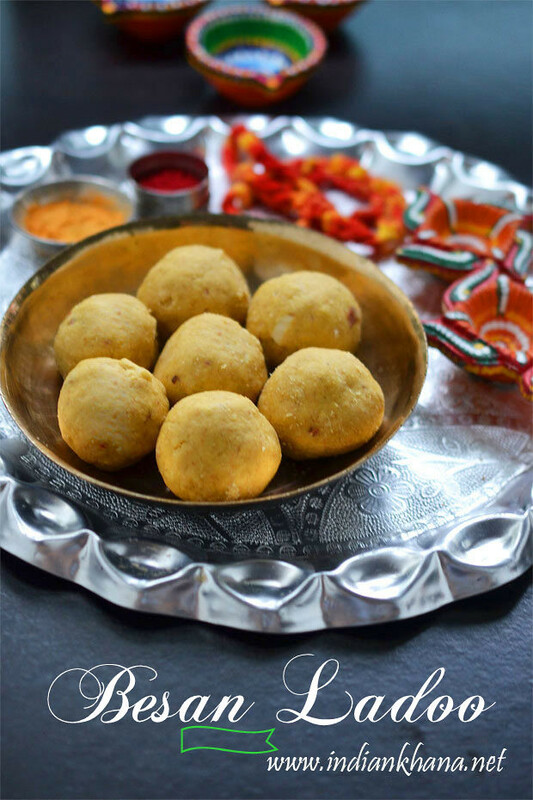 Popular and delicious Besan Ka Ladoo for Diwali or to make any festival special.